Must Love Dogs is located just a short stroll from Rutherglen. Here you’ll find a number of cafes, pubs and restaurants, as well as the information center and sights like the Wine Bottle Water Tower. Must Loves Dogs was originally built in 1840 as one of the first pubs in Rutherglen, The Globe and has been lovingly restored by the owners Charlie & Chris. The accommodation offered includes a Chandelier Suite, Garden Suite and a self contained cottage, all of which are dog friendly. A fully cooked breakfast and fantastic conversation from your hosts and the other guests is enjoyed in the patio outside during summer or in the heritage dining room during winter. During our stay here, we especially loved that there’s a solar heated pool for use by all guests, dogs included. Accommodation Type: Bed and Breakfast (where a fully cooked breakfast is actually included!). There is also the option to stay self catered in their onsite cottage. Location: Rutherglen, a small town in north-eastern Victoria, Australia. It’s near the Murray River border with New South Wales, just over three hours from Melbourne and roughly 6.5 hours from Sydney. No of Bedrooms/Beds/Guests: There are two suites at Must Love Dogs. The Chandelier Suite (which we stayed in) and the Garden Suite. Both these are designed around a bedroom, en-suite bathroom and a sitting room for a couple. There is the option for additional beds to be set up, however this would make it more crowded in the spaces. The self contained cottage is a little larger in space and can accommodate two couples (one in the bedroom and the other on the sofa bed in the living area). No of Bathrooms: One in each Suite and the Cottage. The Garden Suite and Cottage have showers and bathtubs. The Chandelier suite just has a shower only (due to its space and heritage listing). Suitable for: Couples. A couple and a child may also be accommodated however we feel it’s ideally a place for a couple stay – to relax and enjoy together. Access & Parking: There’s plenty of off street parking outside the property. Recommended Time of Year to Visit: Autumn and Spring would provide ideal weather for visiting the Rutherglen region. Summer and winter are well accommodated at Must Love Dogs with air conditioners and heaters. Each Suite and the cottage have an individual fully fenced outdoor area. There weren’t a whole bunch of dog rules to be found – dogs are permitted on the couches and beds…and the pool. They can go in the shared outdoor areas (but you would need to exercise courtesy & common sense as the other guests staying there will likely also have dogs). Water bowls are provided in the Suites & Cottage, as well as in shared areas and outdoor areas. Pooper scoopers and a bin for disposal found in each outdoor area. Clean up supplies are provided should your dog have an accident inside. Dogs are permitted to stay in the room or outdoor area, if you wish to head out without them (not that we recommend this for any prolonged length of time). Free pet sitting by arrangement. Yummy afternoon tea on arrival. Complimentary chocolate & Muscat (a local specialty) to enjoy during your stay. Complimentary tea, coffee and ice is provided. Nespresso machine with pods is also available for guest use in the patio area. Delicious fully cooked breakfast (Charlie has owned and managed restaurants in his earlier days, so it’s a great breakfast that you get!). Large beach towels provided for use in the pool area. A BBQ is available in the shared outdoor area. Suites and the cottage have tv, videos and games for the guests use. It’s a truly Dog Friendly property to stay at. It’s called ‘Must Love Dogs’ for very good reason! Chris and Charlie’s Hospitality. They are more than willing to give you their local knowledge of which wineries and places to eat that allow your dogs to enjoy the atmosphere as well. They also provided us with vouchers for complimentary tasting platters at a couple of the local wineries. History of the Property. Built in 1840, Must Loves Dogs has that old world charm and was previously home to one of the first pubs in Rutherglen, The Globe. It’s lovely to stay somewhere that has it’s own interesting history. Location of the Property. It is just a short stroll into town and centrally located for exploring the region’s wineried & produce. Closeby you also have the Murray to Mountains Rail Trail and the Murray River. Chris and Charlie’s five dogs have the run of the garden/patio area when they are there visiting. This is where breakfast is served in Summer, so guest dogs mostly have to stay in their suites/cabin during this time. Minimum stays may be imposed at Must Love Dog’s discretion. A 10% surcharge applies for peak holiday and festivals. You can organise add-ons with Chris & Charlie, including evening meals, winery tours and picnic baskets. The self catered cottage is wheelchair friendly. You can add breakfast to your stay in the cottage for an additional fee. WiFi is limited and needs to be organised with Chris. 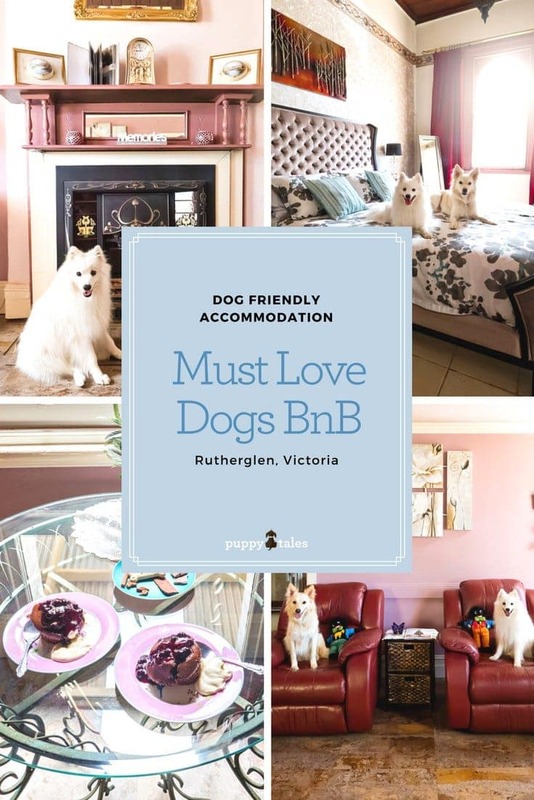 Must Love Dogs has won numerous awards for their accommodation. This includes being one of the best 25 Bed & Breakfasts in Australia, certificates of excellence awards and highest ratings on booking platforms. We stayed at Must Love Dogs in December 2017. Information and services available may have changed since then. Please confirm any special requirements or wishes with Must Love Dogs prior to visiting yourself just to ensure that you too have a wonderful stay!